we praise your name and join their unending hymn…..
Those words, which are spoken each time we celebrate Holy Communion, prepare us for the celebration of the gift of the Sacrament by reminding us that we are joining with the Saints of the past and the Saints of the present at the heavenly Banquet table. As we kneel at the rail we are there at table with the entire host of the Saints of every age. What an amazing gift to us this is. And like many of God’s gifts, this is one that is easy for us to loose sight of. Think about it for a minute – who are your favorite saints? One of the apostles, St. Paul, St. Francis, Martin Luther? Or perhaps it is someone more recent – someone famous, or even someone who was important to you in your life as you grew and learned the faith – a parent or grandparent, a Sunday School teacher or pastor, a teacher or a coach. Maybe this person is still alive, or maybe this person has joined the host of the Saints who now sit at the Lord’s banquet table. But on this day – The Feast of All Saints – we have the opportunity to remember and honor the memory of these Saints; we have been given the gift of being able to celebrate the witness of the Saints of all ages who have impacted our lives in one way or another. So then, what is a Saint? Simply put, a Saint is a follower of Jesus. That’s all. We all know that, right? We hear that repeated each year. Perhaps the most popular All Saint’s children’s sermon is the one I used last year = kids, I am going to introduce you to a saint this morning and then you pull out the mirror and they see themselves. Who me – yes you! You are a Saint. We sometimes think of Saints as being folks who lived only in the past, who had a special relationship with God, or who were particularly holy. But this Festival reminds us that one does not need to be canonized in order to claim the title of Saint – we are all Saints. And we stand with those Saints of all ages – those both who are well-known and those are not. And with them we share these characteristics: we are all followers of Jesus, we have all been brought into God’s family through Baptism and we are all sinners who have been saved by God’s grace. A Saint is a follower of Jesus. That leads us then to the question of calling. What is the calling of the Saints? What is our calling? Or in other words, to what tasks has God called us? To answer this question we turn this morning to our Gospel text from St. Luke. This is in many ways a hard reading. It sounds a little familiar in places because it is a lot like the Sermon on the Mount from Matthew, but it is different from Matthew. Luke is particularly interested in the issues of poverty and wealth and power and weakness. If you read through the Gospel of Luke you will find that this Gospel is constantly returning to this issue. In Chapter 1, Mary goes to visit her cousin Elizabeth and when she gets there she sings a beautiful song – My Soul doth magnify the Lord, and my Spirit rejoices in God my saviour….. eventually she sings these words: God has filled the hungry with things and sent the rich away empty, Gode has scattered the proud in the imagination of their hearts, God has cast down the mighty from their thrones and lifted up the lowly. Later in chapter 4, Jesus goes into the synagogue to preach his first sermon – the text he chooses is from the prophet Isaiah: The spirit of the Lord is upon me, because he has anointed me to bring good news to the poor, release to the captives, recovery of sight to the blind, to let the oppressed go free and to proclaim the year of the Lord’s favor. There are parables and any number of other teachings which also lift up this theme. And then we come to this text with its blessings and woes. These scripture texts are frankly uncomfortable, or they should be. We live in what is probably the richest nation in the world in a world where the majority of the population lives in terrible poverty. We cannot then just shrug off these words of Jesus, or spiritualize them. These words are directed at us – the Saints. So what is Jesus saying? This teaching of Jesus is saying that God has special concern for those who struggle, for those who are poor, for those who are grieving, for those who are hungry, for those who are weak. God holds those who are dispossessed in a special place in God’s heart. And Luke also reminds us that those who take advantage of those who are struggling, those who benefit at the expense of others are only deepening their own alienation from God and others. How does this then relate to our task as Saints; to our calling to follow Jesus? This text from Luke provides a vision of ministry. Those who are Saints are called to find ways of reaching out to heal the rifts that divide people, to feed the hungry, to clothe the naked, to visit the lonely, to comfort those who mourn; in short, to be the presence of Christ in the midst of a needy world. This is not as easy as it sounds, because sometimes it means standing up against powers and special interests. There are many who benefit from human suffering and misery and from maintaining divisions among people. We are called to oppose them, and to stand with those who suffer. This is what it means to be a Saint. This may seem overwhelming, too much for us to deal with – but this is our calling. There is a Haitian proverb that essentially says that once you have climbed one mountain, there will be another mountain to climb, and another after that and another after that. That life gives us a series of mountains to climb one after another. In other words, once you overcome one hurdle there will be another and another. But that it is in these hurdles and in the task of dealing with them and overcoming them that one finds the presence of God. God is found on the mountains as we endeavor to climb them. You can count on it. Whatever life puts in our way we can be assured that God is there in the midst of the experience, in the midst of the struggle. And, returning to Luke, then as we struggle to find ways of bridging divides between peoples, of feeding, providing healing, comfort and so on – God is there with us. And when we fail, when we give up or when we are tempted to put our own interests above those of the community, when we reject others – God is there to help us see and to forgive and give us the strength and wisdom to move forward. So what is the calling of the Saints? To live in a way that reflects God’s love and grace and care for the dispossessed; and to be the presence of Christ in the midst of a hurting and needy world. To support ministries that accomplish this and always seek after finding new ways of reaching out and caring for others. Finally, where are we Saints bound? 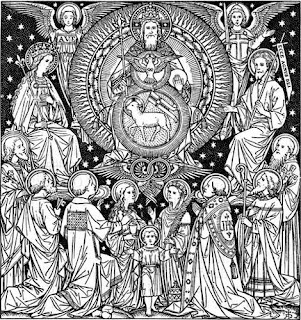 We are bound for the Banquet Table of our Lord – where we will sit with all the Saints of every age and feast at the table of the Lord. And to encourage us along the way – God will give us a little preview this morning; a foretaste of the Feast to come! 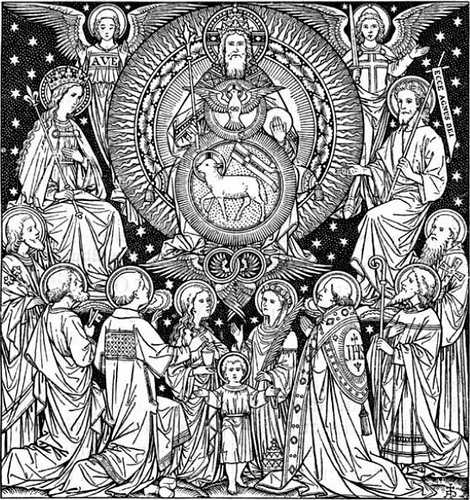 So - Saints – come and feast at the table of the Lord! And there receive the Spiritual nourishment that you will need to strengthen and empower you to accept your calling to live like a Saint! What a good sermon, Blake! There is rarely a time that I don't feel that"great cloud of witnesses" when I am in church waiting to go to the communion rail... my family members who are gone, others that I loved, and oddly enough people of history, even at times the old rascal Henry 8th. It is a connection, a great universal connection to mystery. And one other comment about the text. One of the themes of Robin Meyers's book is that we should stop worshipping Jesus and start following him, heresy I'm sure ,but very realistic in a world so confused, so filled with violence and all the horrors it brings.